Increasing pressure on resources and the insatiable need to produce ever more content for more channels means many publishers are looking at creative ways to source high quality articles. The traditional op-ed pieces has emerged as an important way for these publishers to provide their audiences with great content while providing brands with a great new avenue to generate brand awareness and credibility. An op-ed is short for ‘opinion editorial’ (or opposite the editorial) and were first used as a form of content for newspapers looking to publish narrative articles which went beyond traditional, objective journalism and instead focussed on the subjective opinion of the author. The first op-ed page of the New York Times appeared in 1970 and was created as a dedicated space for outside contributors. The ‘editorial’ section of newspapers remains reserved for in-house writers or editorial boards to provide the opinion of the publisher. The op-ed harks back to a time when there was a clear distinction between editorial and opinion and it was important to segregate opinion from news, lest the sky fell in. As more publishers open their pages and sites to third party content the ability to craft a great op-ed that achieves the right balance between thought leadership, branding, marketing and engagement is becoming more valuable. Writing a great op-ed that has the ability to not only attract and engage an audience but also achieve marketing outcomes is emerging as one of the most important tools in the public relations arsenal. Our client simPRO Software often uses op-ed pieces to grow their brand awareness and discuss important issues for their audience. 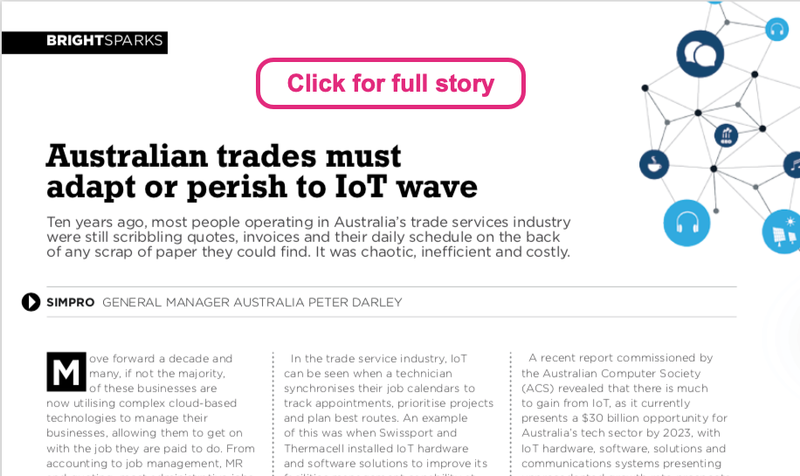 The article above appeared in the latest edition of Circuit magazine and highlighted the need for electrical contractors to build their understanding of IoT, an important growth channel for simPRO. It may seem obvious, but the first step to crafting a great op-ed is to have an opinion. The more contrarian the better. In the digital age where views, even sensible ones, can attract a crazed horde of online trolls forming an opinion and arguing it can be a daunting experience. An op-ed should challenge prevailing thought and provide a new line of thinking about a traditional problem. The best op-eds throw out the prevailing wisdom about a topic and introduce truly disruptive thinking. Your op-ed should always start with a hypothesis that you set out to prove or disprove. The best place to start is with a simple statement. A thought. An idea. A quick scan of the op-ed pages of major newspapers will provide a good insight into how to create a great piece. The headline should always be a dead giveaway and critical to attracting a reader. You don’t need to start with a perfectly formed 600-word piece full of prose and nuanced analysis. That comes later. The premise of your piece will dictate the entire narrative so be sure to get it right. There can be no doubt that some of the best ideas in history have ended up on the cutting room floor due to lack of coherence and basic writing skills. Thankfully, the very best op-ed pieces are marked not by their complexity, but their simplicity. Columns are most typically conversational in tone, so you can imagine yourself have a conversation with your reader as you write (a short, focused conversation). But the range of voice used in columns can be wide: contemplative, conversational, descriptive, experienced, informative, informed, introspective, observant, plaintive, reportorial, self-effacing, sophisticated, humorous, among many others. These simple tips should get you on your way. – Use third party data and research to justify your arguments or background. – Assume your ready knows little about the topic so explain any complex ideas or terminology. – Give context and background to help the reader see how your idea developed. Most op-ed pieces will be written specifically for a publication. If you have convinced the editor to give you some space, make sure you take the time to understand their audience and their editorial priorities. Write using a tone and language that reflects the audiences’ level of understanding about the topic. If you are writing for a specialist trade magazine it is probably fine to use industry jargon. If you are writing for a wider audience, assume the reader knows little or nothing about the topic. A good way to perfecting your voice and tone is to get in the habit of reading your column or op-ed out loud. Doing so gives you a clear sense of how your piece might sound – what your voice may come off as – to your intended reader. An op-ed is not an opportunity to write 500 words about your products and their incredible features and great pricing. That’s called advertising. Integrating product references, branding or marketing messages into your piece requires certain degree of subtlety and sophistication. Not just because your piece may get spiked, but because readers have finely-tuned detectors and can tell the difference between insightful, inspired thinking and a thinly-veiled product flog. Any value from the piece from a commercial perspective should be driven by a desire to establish yourself and your brand as a thought leader. If thought leadership is part of your ongoing marketing strategy please feel free to get in touch to discuss how RGC can make it happen. Email ben@rgcmm.com.au or call +61 415 743 838.